Tangkahan is a small village located just a 2.5-hour drive away from Bukit Lawang. This village is famous for its Sumatran Elephants and its beautiful, untouched nature. Tangkahan is home to merely seven elephants (and a few small calves), which were brought there for rehabilitation. It’s a beautiful place to see semi-wild elephants up-close and have the experience of washing/bathing them in the nearby river. These activities take place two times a day. There are several options for taking this tour. Transportation can be by motorbike, car or jeep (both with AC). Around 9AM your guide will pick you from your guesthouse in Bukit Lawang. From here you will start your journey to Tangkahan by motorbike or car/jeep. It is a 2.5-hour drive along a bumpy road through small villages and palm oil plantations. There will be the opportunity to feed and wash the elephants during their two-time daily bathing ritual in the river. Seeing how much these large animals enjoy their bathing time and the brushing will be the highlight of your tour. 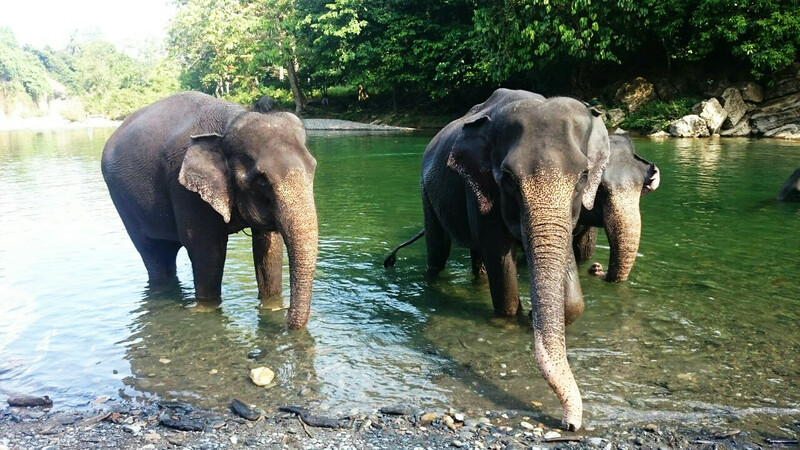 When the elephant bathing ritual is has come to and end, there is time to take a short walk to a natural hot spring where you can swim and relax. In the late afternoon, you will be brought back to Bukit Lawang by selected transportation.